In a post on his blog, Darren Rowse from the excellent blog Problogger.net revealed how he has turned down several offers for one of his blogs. The blog in question is called Digital Photography School – and is just three years old (or so). I found it interesting that he has considered the first 2 years as a “launch phase”, when most of us would consider that running a blog for 2 years of hard work as nothing more than just that, hard work! • getting an initial design up (I launched with a free design and quickly upgraded to a purpose built one. It’s now dated and we’ve outgrown it – but it has served us well). • building community (this takes time. Initially I did it with a Flickr group and then leveraged that to start a forum – now with 23,000 members). • building a ‘list‘ (at the heart of DPS is a newsletter which drives traffic and builds community. It is sent to around 48,000 subscribers per week). So as you can see, the launch phase has been very well executed indeed. Another thing which is surprising is that the offers he has received (3 of them in high six figures) is that none of them were interested in how much the site was making or even how much traffic it was getting. Yes, that is worth reading again! All they were interested in was the fact that it was a “solid” business. They were just interested in the fact that the blog had a brand, loyal readers, busy community and a high amount of user participation. The first is that you should treat your blogging like a business. 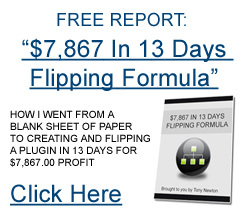 There are only very few cases where you can make millions online in a short space of time. The whole “get rich quick” phenomenon that people associate with the internet just isn’t there. But there have been several recent cases (including Bankaholic.com selling for $15 Million after just 2 years) where blogs are being sold after just a couple of years for high six figures or into the millions. So the second thing to realise is to build a solid foundation to begin with. Don’t try and get thousands of links and hammer popup boxes all over your blogs just to get an email address. Concentrate on creating good, appealing content that your readership loves and will come back for more. Encourage comments and reader participation, which is a huge mistake that most bloggers make. People love sharing their opinions and doing so on your blog not only gives you extra free content but can start dialogues. When this happens people will link to your blogs and discussions will continue. Also make sure you add content as often as you can. There’s nothing worse than finding a nice looking site with great content, only to find you visit a week later and nothing has changed! The whole point of blogging is the ease of which content can be added on a regular basis. Try to post everyday but don’t leave gaps of 4 days or longer because readers may look elsewhere. Hopefully you have found this as interesting as I have, that in just a couple of years you could possibly be offered a Million dollars for your blog. If that doesn’t give you inspiration you need, nothing will! I have a new baby blog Creative Potager that I started December 27th. I understand from conversations with other bloggers it is doing very well with 55 posts (Monday-Friday) 5,180 views and 646 comments (half of which are my responses). I have no real idea. I just do what I love, knowing I have been given a hand up by some more established bloggers who comment and link to me. To maintain momentum…As a writer I have coached myself to go deep on one – only one – thought in a post. This allows me to have the direction and energy to build a series of posts during the week. And I have a built in design to encourage conversation with a “sprout” question in each post. I ask a question that I am wanting think about for the day. That is a lot of comments, so your content must be very engaging. Just continue doing what you are doing and you’ll have a very popular blog in no time at all.